A couple of nights ago, while waiting for Suami Terchenta to finish his night course @ Cititel, I went to KLCC to cuci mata. Ya, ya... Working at KLCC doesn't mean I get the chance to cuci mata frequently. Usually lunch time I stay in the office coz so lazy to go down. Suddenly walked into Isetan and blew away what's left of my salary on Communique blouse and Executive pants! :O I can't help it, leh! The mega sales discounts were so irresistible and no way I could get THOSE clothes at THOSE prices any other time. Hanya Tuhan membalas (as Diyana of diyanazman.com would say). I know, I know! I've got one already and since I don't go swimming every day why need two, right? But LOOK AT THAT DESIGN! How not to fall in love with that burqini? (Btw, burqini is the more or, a loooootttttt more modest version of bikini for Muslimah) Check out Al-Fareeda Bazaar for this kind of swimming suit. The price is reasonable too (RM100) compared to other online shops selling similar item. With the new baju, also need new tudung. Jen can become a testament to this crazy habit of both mine & Ainie's. These shawls are gorgeous. 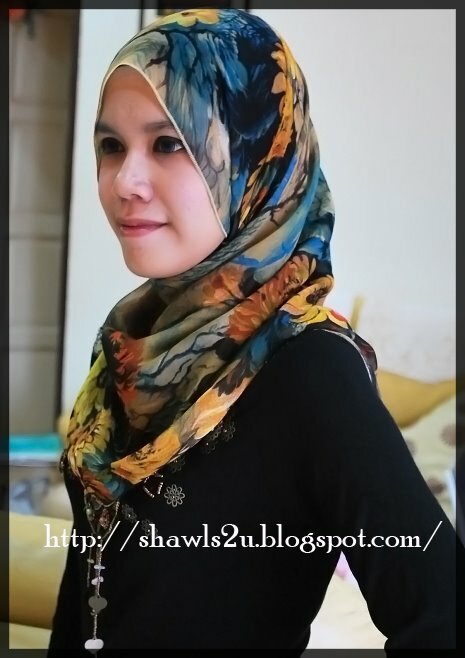 The good thing about this blog is, not only the lovely ladies sell shawls, they also provide step-by-step guide on how to wear them with style & elegance!